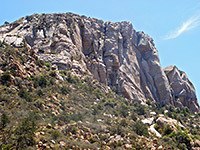 Granite features prominently in the rocks around Prescott, central Arizona; most visible are the Granite Dells along Highway 89 on the north side of town, where for several square miles the land is covered by large rounded cliffs and boulders of pinkish-grey granite, between Willow Creek Reservoir and Watson Lake. 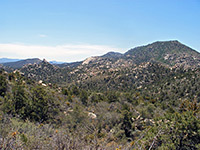 Similar scenery is found in several more remote sites nearby, and for hikers, the best place is the 9,799 acre Granite Mountain Wilderness, northwest of Prescott; here a pristine area of chaparral, rocky hills and pinyon-juniper pine woodland is crossed by several trails, all centered on 7,626 foot Granite Mountain. The side road to Granite Mountain branches north off the Iron Springs Road, 4.5 miles from Prescott town center. This enters the Prescott National Forest but unlike most such land, free camping is not permitted though there is a nice NFS campsite ($10 per night) next to the road, set in open pine forest between rounded boulders and patches of coarse, clean, granitic sand. The Yavapai Campground has 25 quite well separated sites with fire grills and tables, affording good views over the surrounding hills. Past the campground, the road continues another mile before ending in a one-way loop past a day use area, a boat launch (for the small, man-made Granite Basin Lake) and a carpark for the Metate Trailhead, starting point for several paths. This has trail maps, rest rooms, free drinking water, and a self-pay fee station - it costs $2 per person to hike hereabouts. For those not camping, Prescott has a reasonable selection of lodging - follow the link for descriptions, reservations and a location map. The path to the top of the mountain (TR#261) starts by descending through a thin belt of trees into a low valley, course of a seasonal stream feeding the lake, then re-enters the forest, soon passing a fence, gate and trail register marking the edge of the wilderness area; no mechanized travel is allowed beyond here. The well used trail continues quite straight alongside a dry wash, gradually climbing, as the vegetation changes, with the trees soon replaced by bushes, cacti, yucca and agave parryi - a particularly sharp-leaved species. Large granite boulders start to appear and the land opens out revealing views of Little Granite Mountain on one side and the steep southern cliffs of the main peak to the other. The cliffs and the area beneath are home to an endangered population of peregrine falcons, and must not be approached during the breeding season (February to July), but at other times the wall is very popular with rock climbers. At Blair Pass after 1.3 miles, the path reaches a second fence and a junction with trails #39 (Cedar Spring) and #37 (Little Granite Mountain), where the route to the summit turns right and begins to ascend the southern slopes. The total elevation gain for this next section is 900 feet over one mile via many switchbacks, though this is a relatively easy climb, never particularly steep, on a firm surface of stone and hard earth, and quite shaded from early to mid morning when the sun is hidden behind the mountain. The main climb ends at the top of a ridge, partly covered by ponderosa pine trees, that provide more shelter for the path as it flattens out and heads east, curving around one lesser summit, over a level area (the furthest point open to horse travel) then finally up to the base of a larger peak (7,185 feet), where the trail ends. This is not the highest place on the mountain since the land rises another 450 feet a little way northeast, a point beyond the official trail though reachable by walking along a cairned day use path for half a mile. 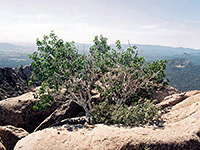 The lower peak, near the south edge of the mountain, is formed by a group of big granite boulders; the path ends just beneath and a little climbing is required to make it to the very top, revealing a nice area with flat rocks, one small aspen tree, and an unobscured 360 degree view over the surrounding wooded hills (see 360 degree panorama). 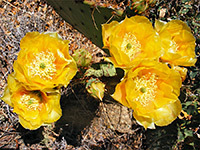 Much of Prescott is visible, 6 miles away, plus Granite Basin Lake and countless square miles of distant, desert land. The walk to this summit is 4 miles, gains 2,000 feet and takes about 2 hours.